From this section in the customizer, you can set your preferences for the content layout, dimensions and typography. Text Align – use this option to decide upon the alignment of the hero text for the inner pages. Choose from left, center and right. Show subtitle – Check this checkbox to use a subtitle phrase (it may serve as a short blog description). Otherwise, for not showing a subtitle, leave the checkbox unchecked. Text Transform – this refers to capitalization, lower case, upper case, etc. Color – select the color that will be applied to the text. 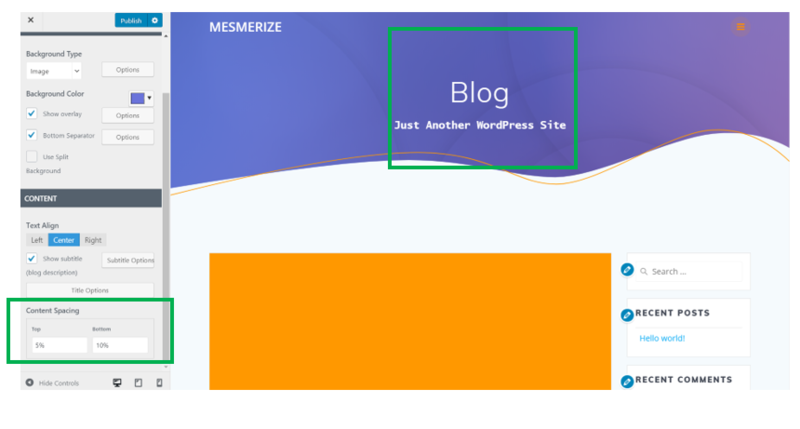 For visibility reasons, the color should be lighter, in case the text is placed on a dark-colored background, or the color should be darker, in case the text is placed on a light-colored background. Title Options – click on Title Options and open a panel where you can make changes to the style of your inner pages title. 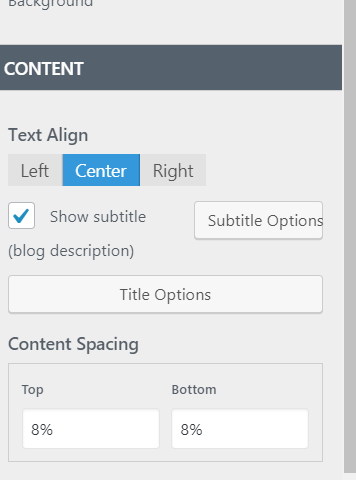 Content Spacing – this option refers to the distance of the content from the top and to the bottom of the inner page hero. It is expressed in percentages.